Satirist; born 1792 at Janischok, Galicia; died 1851 at Brody. The first part of his life was full of struggles and hardships. After having associated for many years with the Ḥasidim, he settled at Lemberg; and through the efforts of some of his friends, such as Rapoport, Krochmal, and others, he obtained pupils whom he instructed in Hebrew subjects. This comparatively happy state lasted for only three years (1813-16). Jacob Orenstein, chief rabbi of Lemberg, having been apprised of the existence among his flock of a small band occupied with the study of secular subjects, excommunicated them all. Deprived thus of his pupils, the only means of his subsistence, he settled in the neighboring town of Brody. There he struggled for a while, until he resolved to study medicine. Erter entered (1825) the University of Budapest, where he studied medicine for five years and passed all the prescribed examinations; he then practised his new profession in various Galician towns, including Brody, where he made himself especially popular among the poor and needy, who found in him a kindly benefactor. He composed a number of Hebrew satires, which have procured for him a prominent place among modern Hebrew satirists. 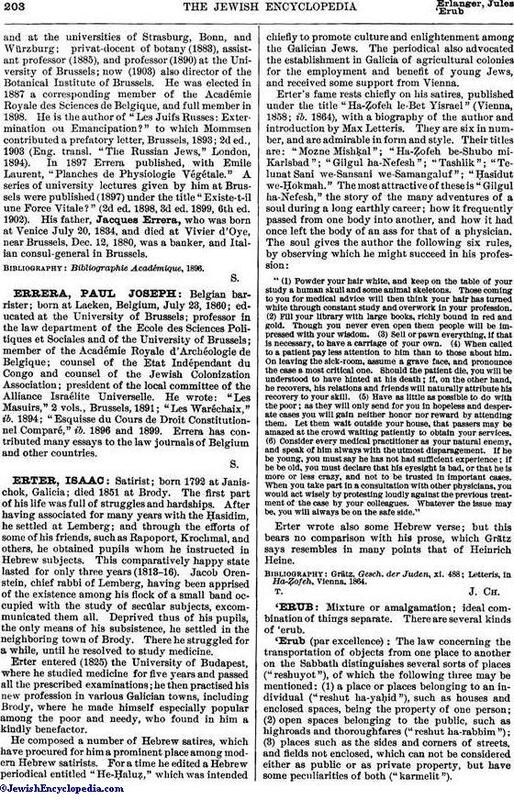 For a time he edited a Hebrew periodical entitled "He-Ḥaluẓ," which was intended chiefly to promote culture and enlightenment among the Galician Jews. The periodical also advocated the establishment in Galicia of agricultural colonies for the employment and benefit of young Jews, and received some support from Vienna. "(1) Powder your hair white, and keep on the table of your study a human skull and some animal skeletons. Those coming to you for medical advice will then think your hair has turned white through constant study and overwork in your profession. (2) Fill your library with large books, richly bound in red and gold. Though you never even open them people will be impressed with your wisdom. (3) Sell or pawn everything, if that is necessary, to have a carriage of your own. (4) When called to a patient pay less attention to him than to those about him. On leaving the sick-room, assume a grave face, and pronounce the case a most critical one. Should the patient die, you will be understood to have hinted at his death; if, on the other hand, he recovers, his relations and friends will naturally attribute his recovery to your skill. (5) Have as little as possible to do with the poor; as they will only send for you in hopeless and desperate cases you will gain neither honor nor reward by attending them. Let them wait outside your house, that passers may be amazed at the crowd waiting patiently to obtain your services. (6) Consider every medical practitioner as your natural enemy, and speak of him always with the utmost disparagement. If he be young, you must say he has not had sufficient experience; if he be old, you must declare that his eyesight is bad, or that he is more or less crazy, and not to be trusted in important cases. When you take part in a consultation with other physicians, you would act wisely by protesting loudly against the previous treatment of the case by your colleagues. Whatever the issue may be, you will always be on the safe side." Erter wrote also some Hebrew verse; but this bears no comparison with his prose, which Grätz says resembles in many points that of Heinrich Heine. Letteris, in Ha-Ẓofeh, Vienna, 1864.